With this atmospheric opening sentence Anthony O’Neill sets the scene for his continuation of the story of The Strange Case of Dr Jekyll and Mr Hyde. The opening to the book creates a mysterious tone which pervades the whole book, a feeling of mystery and unease as we meet lawyer Mr Utterson, seven years after the disappearance of his friend Dr Jekyll and the death of Mr Hyde. Most people will probably be familiar with Robert Louis Stevenson’s original novella either through reading at school or a film or tv adaptation. Don’t worry if you haven’t read it though, as enough is referred to throughout the book for this story to make perfect sense. Mr Utterson is just about to inherit Dr Jekyll’s property and estate when he is shocked to find a man has returned to Jekyll’s house claiming to be the man himself. Utterson knows this can’t be true, that the man must be an imposter, as he has documents written by Jekyll himself stating that Jekyll and Hyde are one and the same. And if Hyde is dead, then Jekyll must be dead too. And yet, this man looks exactly like Jekyll and his closest friends and acquaintances believe him to be Jekyll. He knows things only Jekyll could know. Utterson though, is not convinced, and believes him to be a fraudster. He sets out to prove that this man is not the genuine Dr Jekyll. From that vivid opening paragraph to the striking end of the first chapter I was hooked by this book. Like the original, it is a novella so is a quick and easy read. But it is so entertaining and clever. With its short paragraphs and fast paced action, it’s a book you’ll be eagerly reading and reluctant to put down. I feel that the author has remained true to the spirit and the atmosphere of the original book with the reader never quite sure what is happening and who to believe. 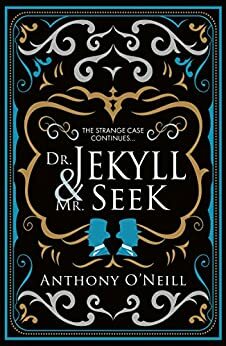 I’m quite sure that I would have been convinced by the man claiming to be Dr Jekyll but was equally convinced by Utterson that he couldn’t be. I could really feel the creeping dread of Utterson as he realised that not only did everyone think that Dr Jekyll was who he claimed to be but also that many close to him had died in mysterious circumstances. I could easily visualise the dark and foggy streets of London that Utterson walked as he tried to prove himself right. The historical details are never intrusive but really add to the authentic feel of the book. It’s a suspenseful novel full of atmosphere and a really gripping read. I think it works really well as a sequel with the language and concept being similar to the original. Do we all have two sides to us with the darker one just below the surface? How close to madness is anyone at any time and what would it take to tip us over? It also had a more modern feel though with that idea of identity theft and fraud. Highly recommended read. My thanks to the publishers Black and White for my copy of this book. It is available now in paperback and as an e-book. You can order a copy directly from the publishers here or from Amazon here. Seven years after the death of Edward Hyde, a stylish gentleman shows up in foggy London claiming to be Dr Henry Jekyll. Only Mr Utterson, Jekyll’s faithful lawyer and confidant, knows that he must be an impostor because Jekyll was Hyde. But as the man goes about charming Jekyll s friends and reclaiming his estate, and as the bodies of potential challengers start piling up, Utterson is left fearing for his life … and questioning his own sanity. This brilliantly imagined and beautifully written sequel to one of literature s greatest masterpieces perfectly complements the original work. And where the original was concerned with the duality of man, this sequel deals with the possibility of identity theft of the most audacious kind. Can it really be that this man who looks and acts so precisely like Dr Henry Jekyll is an imposter? Anthony O’Neill was born in Melbourne but has since moved to Edinburgh. He is the author of Scheherazade, The Lamplighter, The Empire of Eternity, The Unscratchables, and The Dark Side. Film rights to The Dark Side have recently been purchased by 20th Century Fox for development by Oscar- winning screenwriter Steven Zaillian.